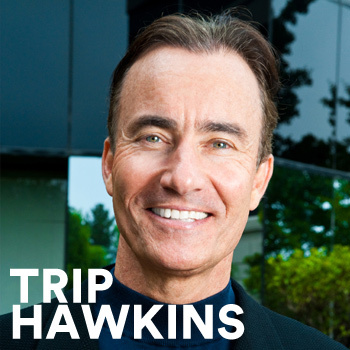 Trip Hawkins is the Academy’s 2005 Hall of Fame game recipient who founded and built Electronic Arts and played a key role in defining the PC industry. Co-Founder and CEO of If You Can Company, a maker of educational games, he also advises game and tech companies including Kixeye, NativeX and Extreme Reality 3D. He joined Apple to work with the founders when it had only 25 office workers and helped grow the company to 4,000 employees. He founded EA in 1982, introduced many fundamental strategies and business practices to the game industry and was the creative and production force behind EA Sports. For his upcoming 2014 D.I.C.E. Summit session he will be speaking on “Tipping Points” where he will illustrate how several tipping points are challenging the game industry to change and pointing the way towards a golden age for games. Minecraft, Fantasy Baseball (my own design), IF..., Munchkin, Clumsy Thief. I'm a truly social gamer so I honestly prefer board games with live in-person players, and fantasy sports that can be a constant source of Internet communication and trash-talking. Then I also get involved in what games my kids want to play with me. More chapters of IF... and more versions of Minecraft. I love the fact that Minecraft made it in part by going retro. I'm also really impressed with the culture of humorous Minecraft videos on YouTube like the guy that burns down his "Frank Lloyd Wright" home by mistake. The game of IF... is an innovative weaving together of gameplay, story, curriculum and student assessment. We're putting a lot of new assets in the game every month now and hope to release it to the public before the DICE event. La Vie De George. This is one of the more clever hybrids I have seen. My son and I play it and are using the mobile app while also building real Lego models with real plastic legos and then taking pictures of them that are graded by the app. All under time pressure. It's collaborative, tactical and mobile. Biographies of creative heroes. I have at least 100 heroes and like to study them, including historical (T.E. Lawrence, Walt Disney), contemporary (John Madden, Reinhold Messner) and fictional (Aragorn son of Arathorn). My heroes are leaders and courageous risk-takers that are often innovative. I find them very inspiring and they've helped me understand what it is like to be creative while also getting things done and having an impact. Lawrence of Arabia, TV sports. I grew up on TV sports and they became a key visual and style reference point for my work on EA Sports. IF... our new game is turning out to feel like a successful hybrid of epic story, solid gameplay and legitimate curriculum that looks and feels like an interactive Pixar film.